Join the discussion on our forums! 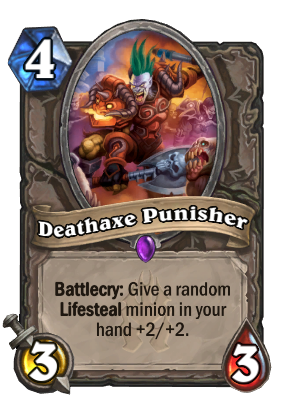 Come discuss Deathaxe Punisher over in our dedicated Deathaxe Punisher discussion topic. The more Lifesteal minions you run, the less valuable they become. That's why this card makes no sense. SO.... Dose this work with Corpsetaker? So, this is what happens when Grimmy Goons become servants of The Lich King? I don't think there are enough Lifesteal minions to make this card good yet, if it ever will be good. I don't see this being used in constructed at all, even not in a life-steal paladin deck. Meh, even with how nice lifesteal is, it's too slow of a card. What is the point of playing understated by 3 minion to give another minion which is not even on the board +4 stats? Mostly just the fact that it is done on a lifesteal minion. Give Wickerflame Burnbristle the buff and he is a 4/4 taunt, divine shield, lifesteal that even priest then can't deal with. Thus it should gain you 8 health.